Esteem is a simple word. It is worth and value that we apply to people, places, and situations. It is the amount of respect we assess. We have esteem for our world leaders. We have esteem for places like church and synagogue. We have esteem for an exemplary performance whether it is in sports, acting, or simply doing the right thing. This e-book has been written for information purposes only. Every effort has been made to make this ebook as complete and accurate as possible. Therefore, this ebook should be used as a guide - not as the ultimate source. But the most important place we need to apply esteem is within ourselves. We must maintain our self-esteem in order to place value on ourselves as a worthy individual in the world. Self-esteem can affect every single part of our lives. If that esteem is low, our lives will be dull and gray. Elevating esteem for ourselves could very well be the key to happiness in life. Most people's feelings and thoughts about themselves fluctuate somewhat based on their daily experiences. The grade you get on an exam, how your friends treat you, ups and downs in a romantic relationship-all can have a temporary impact on your wellbeing. Your own self-esteem, however, is something more fundamental than the normal "ups and downs" associated with situational changes. For people with good basic self-esteem, normal "ups and downs" may lead to temporary fluctuations in how they feel about themselves, but only to a limited extent. In contrast, for people with poor basic self-esteem, these "ups and downs" may make all the difference in the world. People with poor self-esteem often rely on how they are doing in the present to determine how they feel about themselves. They need positive external experiences to counteract the negative feelings and thoughts that constantly plague them. Even then, the good feeling (from a good grade, etc.) can be temporary. Healthy self-esteem is based on our ability to assess ourselves accurately (know ourselves) and still be able to accept and to value ourselves unconditionally. This means being able to realistically acknowledge our strengths and limitations (which is part of being human) and at the same time accepting ourselves as worthy and worthwhile without conditions or reservations. What we want to do is help you raise your self-esteem to levels that will enhance your life and the way you view life. It can make a tremendous difference in your quality of life. Learning techniques to raise self-esteem can be taught and put into practice in just a few days. However, it will take practice to keep your self-worth at the forefront. We can show you how to improve your self-esteem in just one weekend! Three short days where you will apply what this book will show you and that will stay with you as your life becomes the bright place it should be. Our self-esteem develops and evolves throughout our lives as we build an image of ourselves through our experiences with different people and activities. Experiences during our childhood play a particularly large role in the shaping of our basic self-esteem. When we were growing up, our successes (and failures) and how we were treated by the members of our immediate family, by our teachers, coaches, religious authorities, and by our peers, all contributed to the creation of our basic self-esteem. An adult who has healthy self-esteem was given this gift in childhood. This could have been done in many ways. Probably one of the most important is being praised for accomplishments. Children who are talked to respectfully and listened to also contributed to healthy self-esteem in adulthood. These children were hugged often and given attention and experienced some type of success in school or sporting activities. On the other side of the spectrum, we have to identify the childhood for those adults who have poor self-esteem. These children were often criticized harshly, were yelled at or beaten, and were given little attention by those they were closest to. They were ridiculed and even teased as they experienced failures in their young lives. They were made to feel they had to be perfect in order to be valued and associated failure in situations as a failure of their whole selves. It’s sad, isn’t it? To think of a child treated that way. What’s even sadder is the effect that treatment has on their lives as adults. We are shaped and molded by our experiences. Do you recognize yourself? How we feel about ourselves can influence how we live our lives. People who feel that they are likable and lovable (in other words people with good self-esteem) have better relationships. They are more likely to ask for help and support from friends and family when they need it. People who believe they can accomplish goals and solve problems are more likely to do well in school. Having good self-esteem allows you to accept yourself and live life to the fullest. Self-esteem plays a role in almost everything we do. People with high self-esteem do better in school and find it easier to make friends. They tend to have better relationships with peers and adults, feel happier, find it easier to deal with mistakes, disappointments, and failures, and are more likely to stick with something until they succeed. It takes some work, but it's a skill you'll have for life. 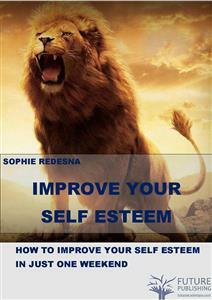 This book is about how to raise your self-esteem, so we will focus on the low self-esteem that many people have these days. You can overcome issues with low self-esteem. It’s not as difficult as you might think. In fact, all you have to do is recognize, understand, and use the techniques we will give you. One of the initial questions we feel compelled to address is what exactly self-esteem is. Some people think that self-esteem means confidence - and of course confidence comes into it - but it's rather more than that. The fact is that there are any number of apparently confident people who can do marvelous things but who have poor self-esteem. Many people in the public eye fall into this category. Actors and comedians and singers in particular can seem to glow with assurance 'on stage', and yet off-stage many of them feel desperately insecure. Indeed, individuals can be stunningly attractive and world-famous, and seem poised and perfect - yet still, deep down, find it hard to value themselves. Think of the late Princess of Wales and Marilyn Monroe and you'll accept, I think, that public adulation is no guarantee of self-belief. So, if self-esteem isn't quite the same thing as confidence, what is it? Well, the word 'esteem' comes from a Latin word which means 'to estimate'. So, self-esteem is how you estimate yourself.